Looking for something cool to do this summer? Everyone's favorite place to cool off during the hot summer days is the Splash Pad at Lynches River County Park! $3.00 for ages 17 and younger. $30.00 season pass (valid during season) for youth ages 17 and younger. $2.00 for ages 17 and younger in a group of 12 or more children. Group rates must be scheduled 48 hours in advance. Ages 18 and older are admitted free with paid admission of youth 17 and younger. Click here to read the Splash Pad Private Rental Policy for Inclement Weather. Proper swimwear is required for anyone planning to get on the actual Splash Pad (wet area). ALL types of cotton clothing; swimwear that becomes transparent when wet; and thon swimwear is strictly prohibited. This rule also applies to swimwear cover-ups. No coolers, outside food, and/or drinks will be allowed inside the Splash Pad Complex. A concessions area is available during regular business hours. Participants must shower before getting on the Splash Pad. Running and/or rough player is prohibited on the Splash Pad. Spitting and/or nose blowing are prohibited on the Splash Pad. Persons with open lesions or wounds, diarrehea, nausea, skin, eye and/or respiratory infections will not be permitted on the Splash Pad. Animals and pets are prohibited inside the fenced area of the Splash Pad Complex with the exception of certified service animals. Smoking is prohibited within the fenced area of the Splash Pad. Smokers must exit the Splash Pad. A hand stamp is available and required for same day re-entry. Glass containers are prohibited within the fenced area of the Splash Pad. For the enjoyment of all participants, radios, CD players and Mp3 players are not allowed within the Splash Pad. Persons wearing diapers must wear a swim diaper. Regular disposable and/or cloth diapers are not permitted on the Splash Pad. 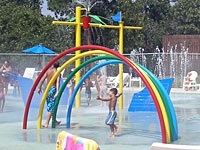 The maximum number of users allowed within the Splash Pad Complex is 300. A first aid kit is located in the First Aid Room within the Splash Pad Complex. During severe weather, staff will advise all users to exit the Splash Pad and take cover. Participants will not be allowed on Splash Pad during periods of lightning or extreme weather conditions.